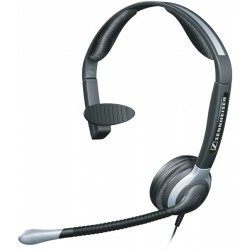 The Sennheiser SH 330 IP is a wideband, noise cancelling corded headset. 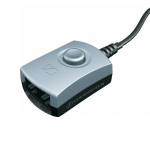 It is designed to be used with your desk phone, smart phone, or computer (each requires the correct connector cable). 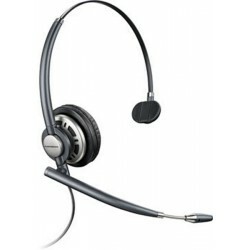 The SH 330 IP is an over the head wearing style, which can be worn on either left or right side by rotating the microphone. 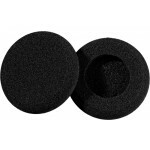 The Sennheiser SH330 IP (wideband) headset comes with both leatherette and foam ear cushions (which saves you buying a spare) as well as a clothing clip and protective carry bag which is great for hot-deskers. It has a lightweight fully adjustable headband. The noise cancelling microphone of the SH330 IP prevents any unwanted noise being heard by your callers, while the flexible boom ensures perfect positioning. The patented Activeguard technology in the SH 330 IP protects the user’s hearing from sudden loud noises which can cause acoustic shock. The headset of course comes with the peace of mind of a 2 year manufacturer’s warranty. The SH330IP is a wideband headset which means it offers the most natural sounding voice quality. If you don’t have a wideband phone this won’t make any difference to you but if you do or may be moving to VOIP in the future, then get this IP version (or any other) of Sennheiser’s headsets. Sennheiser’s years of expertise & experience in high end professional audio has been ploughed into their headsets and has created the new benchmark in headsets. Even their entry level headsets are excellent. It’s hard to put this delicately but if you’re thinning ontop the thin metal headband may not be the most comfortable option for you.Other than that, the negatives of the Sennheiser SH 330 IP corded headset are really just generic corded headset issues; You are tethered to your phone via a cable, this can be frustrating when wires lie across your desk and get in the way of papers or drop down and get crushed & tangled under chair wheels. If your work requires that you move about before or during a call, a wireless headset can save you time and hassle (and tangled hair! ).If you don’t have a headset port on your phone, a corded headset will take the place of your handset. If you still want to use the handset you can pick up a switch to allow you to swap between the two. 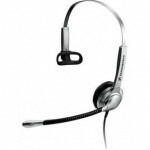 The Sennheiser SH330 headset is a stylish solution for users that need to communicate with colleagues around them in between calls. For users that are on calls for extended periods of time, or have a particularly noisy workplace the Sennheiser SH350 or SC 260 may be a better option to increase call concentration. If staff sit close together and it’s really noisy the ultra noise cancelling of the Sennheiser CC 520 is definitely worth the extra investment. If you’re not yet brand loyal to Sennheiser, the Plantronics HW291N is an executive styled option. With its light-grey metal headband, the SH 330 IP appeals to business professionals looking for a stylish headset. The SH 300 range is known for it’s leather and foam cushions which makes the headset very comfortable to wear and makes light weighted headset is ideal for extended use on a daily basis. Compared with traditional narrowband headsets, wideband technology offers a more natural and warm sound, and captures more speech details at high and low frequencies. 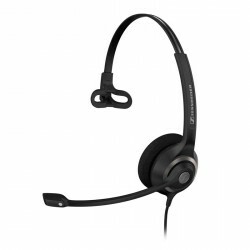 When connected to a wideband supported communications line, the SH 330 IP wideband headset delivers natural high-definition sound for superior voice clarity, accented speaker recognition, and reduced echo. The benefits are increased productivity and less fatigue on business calls. You'll experience crystal-clear sound thanks to a noise-cancelling microphone that filters out ambient noise and a unique foam ear pad that channels sound for maximum quality. The adjustable headband for a balanced fit, and adjustable microphone boom, with durable Teflon®** washer for personalised microphone placement ensure optimum comfort and stability. Last but not least, ActiveGard™* technology protects against acoustic shock and sudden sound surges.